Everything’s coming up emerald—green, that is—in fashion and interiors, and we LOVE it. Look at the detail of the central green and black enamel piece (almost 3” long) as well as the smaller one attached a bit higher. 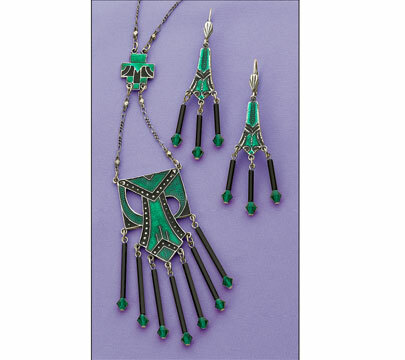 It’s accented with black bugle beads and diamond-like green crystals. The chain (18” adjustable) with its faceted metal beads, gathers in a very dramatic way to enhance your neck. I wore this at a recent Deco Society event and got lots of compliments And let’s not forget the companion enamel drop earrings (2” long), with black and green crystals, and stainless steel wire.